“What feature should we build next?” Ain’t that the question of the year? While that next feature won’t save your business, it’s still important to actually improve your product and create more value for your customers. And figuring out what you should tackle next may be one of the hardest decisions you make on a regular basis. Most founders (heck, most people) are overflowing with ideas. The problem is, most ideas are, you know…terrible. But they seem great right when you have them. Mix an overflow of ideas with the difficulty of prioritizing what to do next and you’ve got yourself the makings of bloated, messy, hard-to-use software that lacks real direction and has little impact on customers. To help combat this, we created a simple scoring system that guides and influences what we tackle next. Our marketing prioritization system is geared towards marketers and marketing efforts, while this is geared towards product teams. This system is quite a bit more simple as it’s nearly impossible to fully quantify and measure the impact or effort required to build something. Building software is a mix of data and gut feelings. You throw everything together in pot, mix it up in the best way you know how, but at the end of the day, you just have to make a decision. You’ll want to make a copy of this Google Spreadsheet so you can follow along. All those ideas that you and your team have for ways to improve your product? You shouldn’t just throw them out the window. You should write them down. In a spreadsheet. Where you generate a DIE score for them. “A DIE score?!?! OMGBBQ, that’s scary!” Don’t worry little Johnny, it’s okay. Let me explain. So my acronym on this is slightly morbid, but at least you’ll remember it. 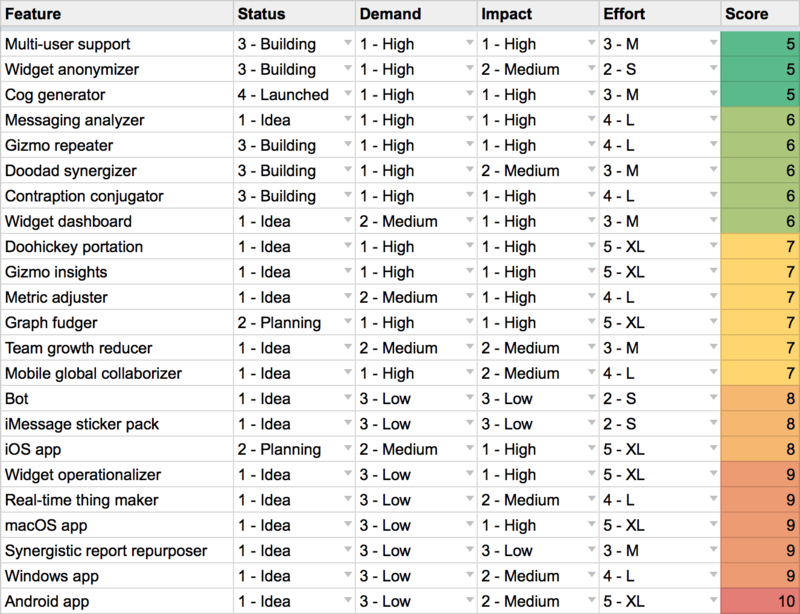 Whenever you have an idea for a feature, you add it to the spreadsheet and then assign three factors a rating. The result of those ratings is a score where the lower the number, the more likely it is you should proceed with that feature next. Demand is how much your customer base and target market wants the feature. If you’re constantly getting a specific feature requested or frequently hear of a problem your customers are having that would be solved by a given feature, then the demand for that would be “High”. If you had some random idea in the shower that you just have a “hunch” people would want but have no tangible evidence of such thing, demand on that would be “Low”. Impact is a factor that will mean different things to different companies, depending on what your primary goal is at the moment. It’s the thing you want to affect. Revenue, customer growth, product usage or any number of other things. How much will this feature impact that goal? That’s what this factor is about. How much work will this feature require? Will your design team need to spend a lot of time doing research and customer interviews? Will you need all of your engineering team heads down on this for weeks or months? Effort is crucial as it ties back to your most scarce resources: time and money. We rate the amount of effort something will take on a scale from XS to XL (extra-small to extra-large). You could change this to some other unit such as number-of-days or even a dollar amount, but we’ve found keeping the unit somewhat ambiguous keeps us from getting overly critical of this step. Once you’ve set the Demand, Impact and Effort factors, you’ll get your score! Again, the lower it is, the more likely it is you should tackle that feature next. As an example, the most ideal feature to tackle next would be High Demand, High Impact and Low (or XS) Effort. For us that’d be a score of 3. On the other end of the spectrum would be Low Demand, Low Impact and High (or XL) Effort, which would generate a score of 11. You probably want to stay away from these. The goal of this is not to create something that categorically makes decisions for you, or to somehow quantify exactly how much business impact this will make so that you can’t screw things up. The goal here is to help guide your decision-making process and reduce some of the unknowns. The purpose here is to systematically build out features in a way that appropriately balances the impact they’ll have on your customers and business with the effort and resources available to your team. Whenever you’ve got a feature idea, before you throw it at your team and tell everyone to start hacking away right now, put the idea in to the feature spreadsheet to give yourself a dose of reality.